Johannesburg - South Africa’s recovery from corruption at its state-owned companies requires thorough reform and punishing those responsible, according to Public Enterprises Minister Pravin Gordhan. Trust in the government is at 42% for South Africa - versus a median of 47% for members of the Organisation for Economic Cooperation and Development - a ranking brought down by factors including corruption and criminal behavior, the minister said in an op-ed for The Sunday Times newspaper. 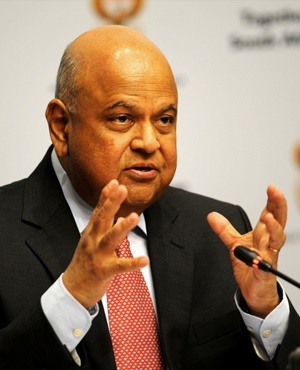 "Not only has corruption reduced trust between the government and its citizens, but it has also depressed the growth rate and extracted resources for private gain," Gordhan wrote. "The challenge now is to rebuild trust and use our resources to advance the national interest." Research shows Eskom, and Transnet, which account for 70% of government spending on state-owned companies, were a focal point of the Gupta family, which has ties to former President Jacob Zuma, according to Gordhan. While the Guptas have been implicated in reports, no one has been convicted. The government started the reform of state-owned companies with new boards, but interventions must go deeper throughout management, according to Gordhan. The challenges "cannot simply be solved with a cash injection", he said. "We have to develop the ability to disrupt corrupt practices, rebuild our state institutions, recover assets that were acquired through criminal acts and prosecute those responsible," Gordhan wrote. "The dangerous and unscrupulous fightback against our reform efforts continues. If we allow this fightback to prevail, we risk losing our sovereignty."